This week, I’m honored to participate in a blog series on the topic of love with Baker Book House. I was in elementary school when I first reached out to my neighbors with Jesus’ love. That was also when I first learned sharing Jesus’ love wasn’t as easy as I thought it was. My childhood church’s Vacation Bible School was the community event of the summer. I recall a photo in my parents’ photo album of 500 kids standing in front of the church. The photographer stood on top of a school bus to capture us all smiling big under the bright sun, with dozens of grinning adults behind us, who I am sure were exhausted. Kids from all backgrounds and all parts of town showed up at the church for a daily dose of games, snacks, and Bible stories. One summer, I invited all my neighborhood friends to go with me. I had so many neighbor friends coming that my mom had to borrow a fifteen-passenger van from the church to transport us all. We squished together on the vinyl bench seats giggling and singing songs we’d learned at Vacation Bible School the day before. Midweek, one of my neighbor friends told us how she’d accepted Jesus and wanted to get baptized. Her eyes shone, and a genuine excitement radiated from her. I was so happy, I thought my heart would burst. She loved Jesus. I loved Jesus. Jesus loved us. We all loved Him back. It was so simple. My friend told her parents about how she loved Jesus and wanted to get baptized. Her parents weren’t excited. They came from a different religious background and told my mom their kids wouldn’t be going with us the next day or any other day. The van became a little quieter the next day. Then a couple more kids didn’t come either. By the end of the week, we didn’t even need the van. It was the first time I felt like an outsider because of Jesus. As a kid, I didn’t understand all the intricacies of what happened, but from that point forward, I felt different. 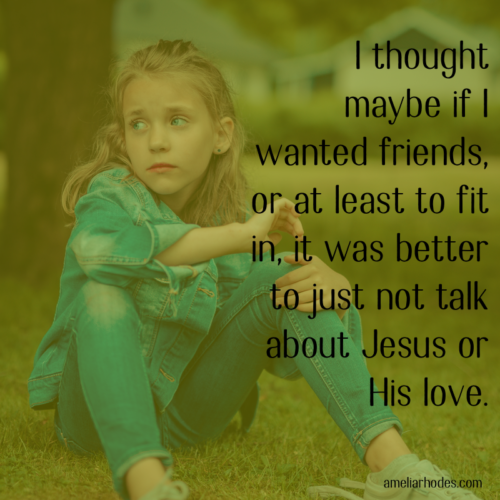 I thought maybe if I wanted friends, or at least to fit in, it was better to just not talk about Jesus or His love. The relationship with my neighbor friends was never quite the same. It became a little more awkward, and a lot more cautious. Something from that event stuck. I didn’t realize it at the time. But loving my neighbors became a battle within myself. 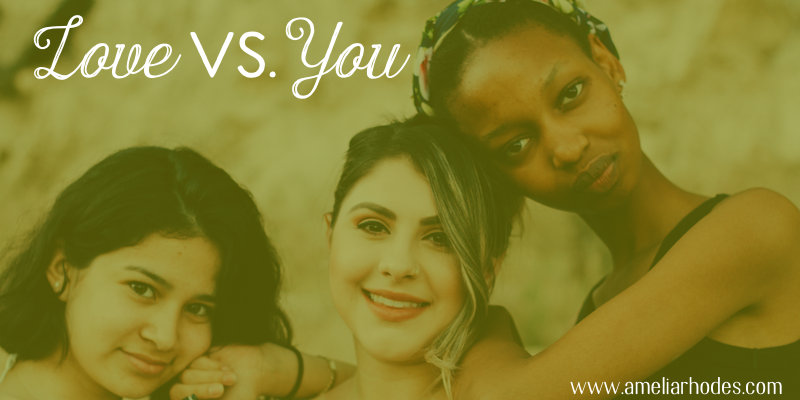 A battle between wanting to belong and fit it in, yet obeying Jesus’ command to share His love and the good news of His life and death and resurrection. Because I grew to understand, loving my neighbors has nothing to do with how I feel. It’s a high and holy command. In the introduction to Love: A Holy Command, Oswald Chambers editor Julie Ackerman Link says, “To comprehend love as a command requires a major shift in thinking. How can we obey a command to feel or prefer something? We tend to think of love as something that happens to us, not something we can call up on command or dish out on demand. Love has an emotional component that we cannot create. A battle ensues every time I strike up a conversation with a neighbor, co-worker or friend and attempt to move beyond the weather and kids into deeper waters of how they’re really doing. Sometimes, when a neighbor opens up her heart about a current struggle, I ask ever so gently, “Would you mind if I pray for you right now?” My 9-year-old internal self still wonders, is this ok? Am I wrecking something here? Will this relationship get weird too? But loving my neighbor isn’t about me or even them. It’s about God. I should expect resistance. I should expect rejection, because Jesus experienced all those things. I should expect it even from the religious community, because Jesus experienced that too. Link reminds us, Genuine love comes from God and flows through us. He provides His love to others through us. When we don’t know how to love, He shows us how through His Word and through His Spirit. He gives courage to pray with the neighbor on the sidewalk, to invite her over for coffee, to build a friendship with a new family in town. He helps us understand and love those who are different than us. He gives us strength to love those who might be difficult to love. The transformed heart has a proper view of self, and thereby is free to love the community without fear or pride or seeking position, but solely to elevate Christ and His grace and love and truth to a hurting world around us. “The truly gospel-humble person is a self-forgetful person whose ego is just like his or her toes. It just works. It does not draw attention to itself” (Keller). In an ever complicated and divisive world, how do we love our neighbors? How do we get outside ourselves, set aside our fear and obey this high and holy command? And for a practical tool to help you pray through issues in your community you might not think of, please consider picking up a copy of my book Pray A to Z: A Practical Guide to Pray for Your Community. Thank you for writing this story Amelia! Once again I’m encouraged to invite a neighbor over for coffee! It was so interesting to read how your childhood story relates to your adult fear of how bringing up Jesus might make a relationship become “weird.” I don’t know when it began for me, but I think I also have that fear. It really makes me think. We need to depend on the Holy Spirit as our guide. Encouraging and challenging article!